Just forty five minutes south of Nashville lies Murfreesboro, Tennessee. This is not the type of town that will be found in bold print on a map, but the passion for their Blue Raiders is well highlighted. 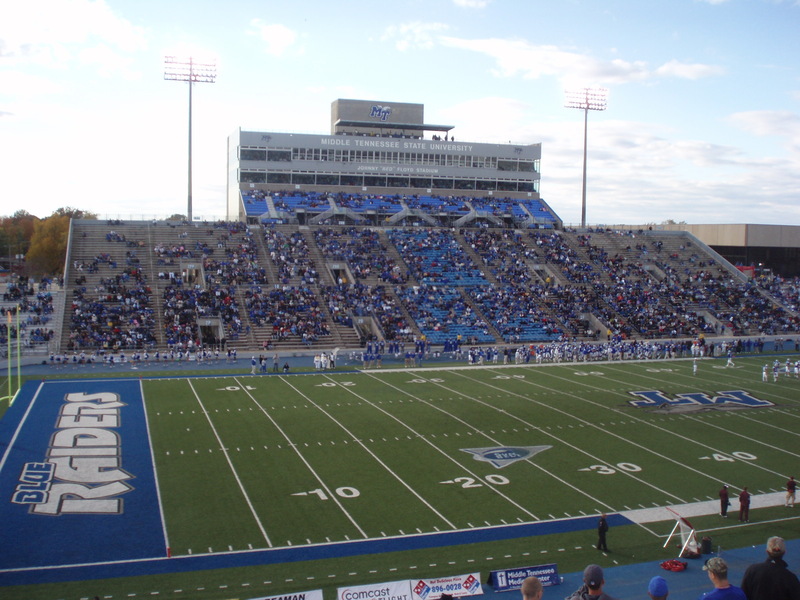 Middle Tennessee State’s campus pops up in the middle of this sleepy town with the stadium being the focal point, as many southern schools are. 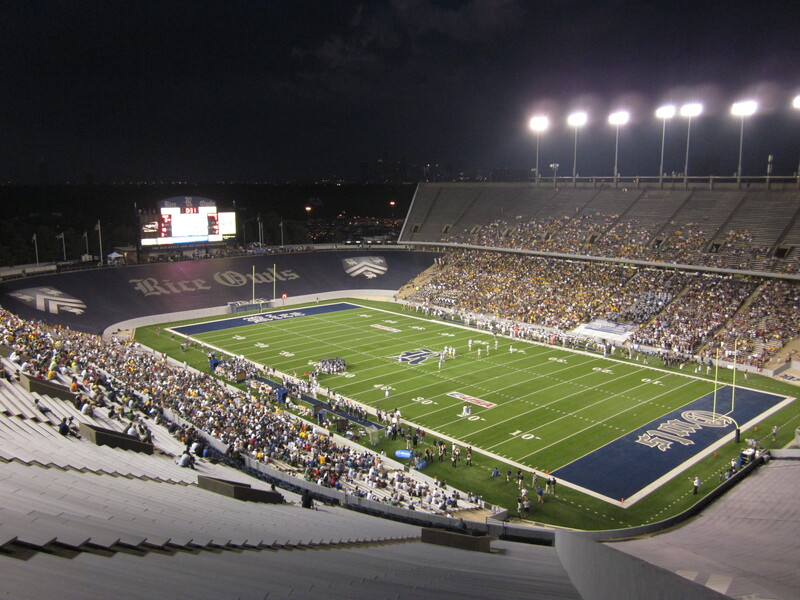 Being in the Sun Belt, one might expect to find a dinky stadium that seats only a few willing fans. 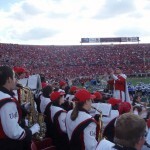 However, this double decker stadium is impressive and holds a congregation of very involved fans. Papa John’s Cardinal Stadium was not exactly booming with excitement on this homecoming Saturday, but the fans came in good force on a beautiful day that really was meant for football. The early lead by Middle Tennessee State caught the crowd off-guard. But, it did not take long for the Cardinals to make a second half push and hold off the Blue Raiders 42-23. 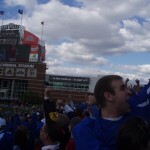 While Louisville fans casually walked away from an expected victory, Blue Raider fans kept the fervor comin’. A late mess of poor calls by the referees had the fans in blue screaming, yelling, and taking it out on those clad in red. 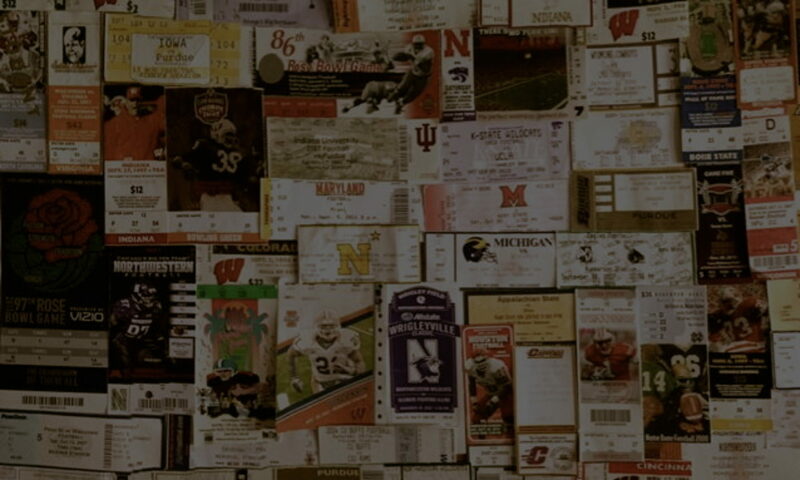 All of this from a team working out of a conference that earns only one bowl bid a year? If this were a MAC team like Western Michigan or Akron, there would a few groans and grunts, but not the outright southern inhospitality that was displayed on Saturday. Honestly, I was impressed and wished more of that same passion from lower echelon midwestern teams. 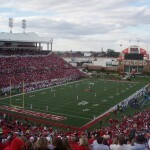 Nevertheless, Cardinal fans went received a happy homecoming while turning a deaf ear to their neighbors from the south. 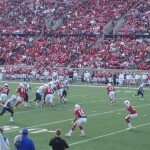 Middle Tennessee scored early causing an eruption of blue in the corner endzone. 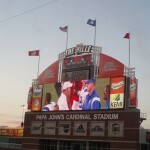 Blue Raiders and Cards battle it out. Beautiful day and beautiful setting! Scoreboard view of the head coaches shaking hands at midfield.